General Sir Adrian Bradshaw KCB OBE, Deputy Supreme Allied Commander Europe, represented Her Majesty The Queen at the CC 153 Sovereign's Parade which took place on 10 August. 184 of the 204 officer cadets were from the United Kingdom, whilst the remaining 20 were from overseas. 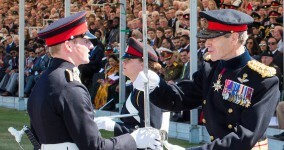 The Sword of Honour was awarded to Senior Under Officer W Clarke who has been granted a Commission in the Welsh Guards. The Overseas Sword presented by the State of Kuwait, was awarded to Officer Cadet Alisa Jung from the Federal Republic of Germany. The Queen's Medal, awarded to the Officer Cadet who has achieved the best overall results in military, academic and practical studies, has been awarded to Junior Under Officer S Camp who has been granted a Commission in the Mercian Regiment. The Overseas Award, awarded to the Overseas Cadet who has achieved the best overall results in military, academics and practical studies, awarded to Officer Cadet Yasmin Donner from the Federal Republic of Germany.